Welcome to ColoHealth. Your privacy is very important to us, and we make every reasonable effort to safeguard any information we collect. We only collect information that you voluntarily provide, in order to present you with an instant health insurance quote, newsletter subscription, special reports, or other information you request from us. When visiting our website, only you choose when to voluntarily provide us with personal information. We do not collect personal information in any deceptive ways. 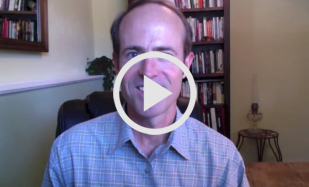 When you run an instant quote, you must provide us with information about yourself. This information is needed in order to determine available plans and quotes for your individual situation. We may contact you occasionally via email to you inform you about ways to lower your insurance and medical expenses. We find email is the best and easiest way to communicate with our customers, and we want to make the process as easy as possible. If you choose to correspond with us through email, we will not share your email address with any third party. When you sign up for our Health and Wealth newsletter or any one of our free reports, your personal information will never be sold or distributed to a third party. We may contact you occasionally via email to inform you about ways to reduce your health insurance and medical expenses. All of your personal information on any application you submit with ColoHealth will only be shared with the insurance company of the plan for which you are applying. Generally, we use personal information for purposes of managing and expanding our business activities, providing customer service and making available other products and services to our customers and prospective customers. Occasionally, we may also use the information we collect to notify you about important changes to our website, new services and special offers we think you will find valuable. All of our email correspondence will give you an option to Opt-out of future emailings at the bottom of the email. The information you enter on our website is transmitted securely via Secure Sockets Layer SSL, 128 bit encryption services.Pages utilizing this technology will have URLs that start with HTTPS instead of HTTP.Please contact us if you have any questions or concerns. You may request access to all your personally identifiable information that we collect online and maintain in our database by contacting us, see the above contact information. We reserve the right to change this notice and make the new notice apply to information we already have as well as any information we receive in the future. We will post a copy of our current notice here on our website. The notice will contain the effective date on the first page, in the top right-hand corner. 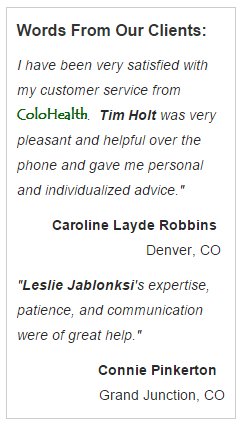 We are so confident that doing business with ColoHealth will save you time, money, and frustration, that we guarantee it. If you purchase a health insurance plan from ColoHealth and are not totally blown away by the service you receive from us before you apply, while your application is in the approval process, or up to 10 days after you receive your policy, you may cancel and receive a 100% refund. In return for providing outstanding service and helping you continue to save money, we expect you to be a client for life, and to refer your friends our way as well!